Vision Zero seeks to eliminate all deaths from traffic crashes regardless of whether on foot, bicycle, or inside a motor vehicle. The Borough Pedestrian Safety Action Plans are one of 63 Vision Zero initiatives advancing that goal for all street users. Although pedestrian deaths have declined since the start of Vision Zero, they still consistently make up the majority of New York City’s traffic fatalities. In an effort to drive these fatalities down, DOT and NYPD released a set of five plans in 2015, each of which analyzes the unique conditions of one New York City borough and recommends actions to address the borough’s specific challenges to pedestrian safety. These plans pinpoint the conditions and characteristics of pedestrian fatalities and severe injuries; they also identify corridors, intersections, and areas that disproportionately account for pedestrian fatalities and severe injuries, prioritizing them for safety interventions. 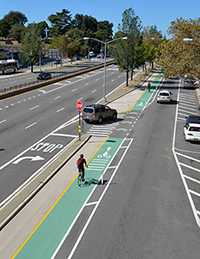 Each Borough Plan was shaped by the community input from nine Vision Zero Pedestrian Safety Workshops held across the five boroughs and thousands of comments collected through the interactive Vision Zero Input map. Finally, these plans recommend a series of actions that intend to alter the physical and behavioral conditions on city streets that lead to pedestrian fatality and injury. In February of 2019, DOT & NYPD released an update to the Borough Pedestrian Safety Action Plans. 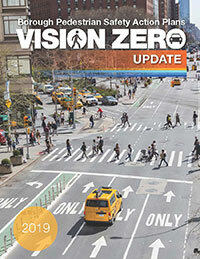 The report updates the Priority Locations identified in the 2015 Vision Zero Borough Pedestrian Action Plans with current data, Vision Zero innovations, progress on Vision Zero initiatives, and introduces new actions. In each borough, heat maps were created to highlight locations with the highest density of pedestrian fatalities and severe injuries. These maps were then used to create borough Priority Maps. Both maps were built on borough crash data, rather than citywide data. Since each borough has a different overall number and density of pedestrian crashes, each borough map is drawn at a different scale. For example, the "red" we observe in the Staten Island maps represents far fewer crashes than the "red" in the Manhattan maps. DOT and NYPD are tasked with addressing road safety for all residents in all boroughs, so creating five separate action plans was the most practical way to develop a robust set of focused, effective actions for each borough.